Posted on 02/24/2013, 20:35, by martin, under General. Looking at the smoothing spline for the monthly data, we see that global warming has stalled for almost a decade now – temperatures even seem to fall slightly. 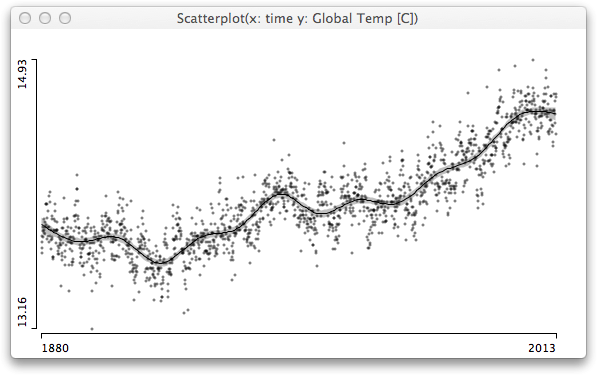 From the first plot we know that CO2 concentration rises steadily, even in the last decade. 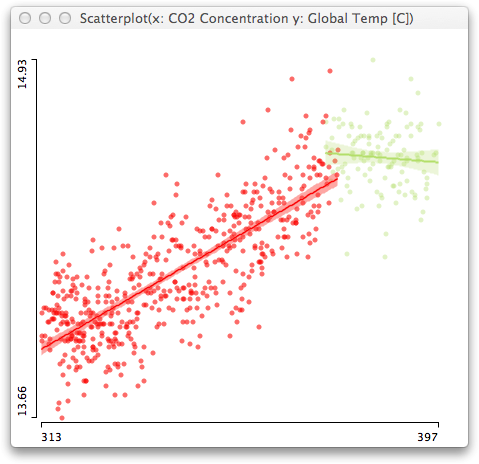 So let’s take a look at the correlation between global temperatures and CO2 concentration. A simple linear regression for the years 1953 to 2003 (red dots) supports the causal relationship, and is supported with an R2 of 0,61. Temperatures rose roughly 0.01 degrees centigrade per 1 ppmv. This was an easy to use model, which leads to apocalyptic temperatures when being projected some decades to the future, as CO2 concentration rises roughly 2ppmv per year right now. But what is the conclusion now? Is the whole CO2 story bogus? The answer is a clear maybe. Doubtlessly, it is stupid to burn the very limited resources of fossil fuels at the rate we are doing right now – especially after fracking became the salvation for all global energy problems. There is no way around using regenerative energy sources which are CO2 neutral and thus are no threat to the climate. 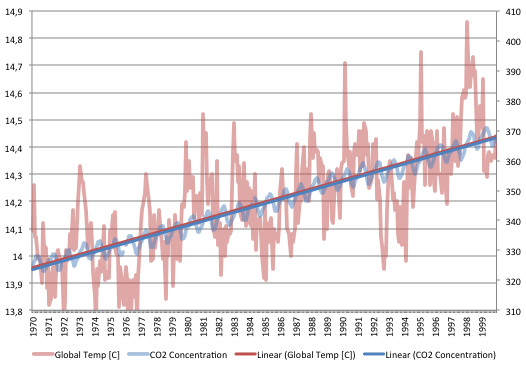 Do we fully understand the changes in global climate? A clear “No”. The timeframes we are looking at for which we have reliable data is so small compared to the timeframe global climate changes occur, that it is hard to derive final conclusions from what happened in the last decades. Nonetheless, we can stop doing stupid thing, and e.g. sell our gas guzzling SUV tomorrow! So it should be no surprise if we see a temperature plateau or even a decline in temperature… these would typically be followed by temperature increases that were all the stronger, since they’d sum long-term trends with short-term increases following short-term decreases. We know a lot about the climate system, and boiling it all down to a simple time-series analysis like this misrepresents that knowledge.